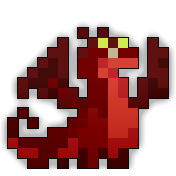 Pyyr the Wicked is one of the five bosses of the Lair of Draconis. Pyyr’s behavior in hard-mode is no different from his normal mode behavior, there’s just more and faster projectiles. Pyyr will be in the center of the room and fill most of the room with lava, leaving a ring of solid ground around the middle. Pyyr will stay in the center of the room and fire sickening shots all around him, as well as gigantic fireballs along the cardinal and intermediate directions.. The red eggs in the corners of the room will spawn Crimson Soul Shards that will fire highly damaging attacks. He is completely invulnerable during this phase. Once all Crimson Soul Shards are dead he will transition to his chasing phase. The room will slowly return to normal and Pyyr will begin rapidly chasing the nearest player. He will spray various shots all around him, including a spiral of red orbs, as well as aim a shotgun of Firewaves at the nearest player. He will sometimes stop chasing for a moment before resuming. Once he hits 50% HP, he will go back to his Lava Phase. The second time he does it, it lasts until death. After all of his minions die in the first phase, Pyyr will quickly lunge toward the closest player. It is advisable to move far away from the group when almost all the minions are dead. The Armor Breaking shots, combined with multiple high-damage shots, can lead to a swift death. Be cautious. If you have a small group, it is recommended to circle around Pyyr the Wicked, dodging his minions’ shots so as to take as little damage as possible. Tanking or standing in one place is better if you have a large group through which you could cycle who takes damage. Pyyr is very aggressive and has the potential to be extremely debilitating to melees. It’s highly recommended to be at least 2/8, maxed speed and defense, before attempting to fight. Note that Pyrr is the only dragon that is able to fire during his death animation. Be wary.